Students at Tel Aviv University and Be'er Sheva's Ben-Gurion University protest Pres. Trump's recognition of Jerusalem, call for intifada. Arab students at Tel Aviv University called for a new intifada against Israel during a protest held last week at the university's campus in response to US President Donald Trump's recognition of Jerusalem as Israel's capital. "With spirit and blood we will redeem you, Al-Aqsa," "We will fight and teach them a lesson via the sword and force," "We will school them through the ways of intifada," "Israel is a terror state," and "Resist, resist," were among the slogans chanted by some 50 Arab students who gathered at the university's Entin Square to protest. 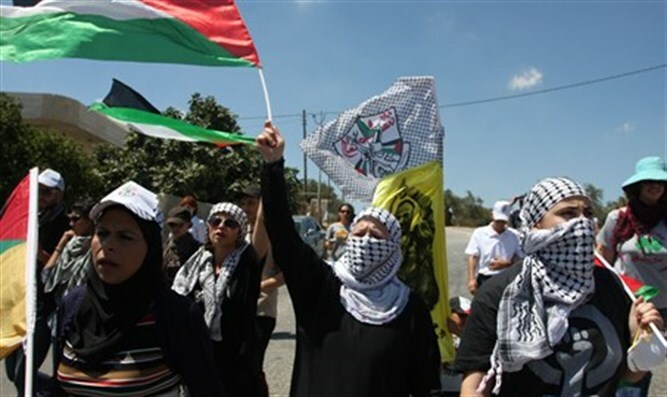 A counter-demonstration was held by activists from the Zionist organization Im Tirtzu, who waved Israeli flags and sang Israeli songs including "Hatikvah," Israel's national anthem, and "Jerusalem of Gold." Last week, Arab students at the Hebrew University of Jerusalem held a protest where they issued calls including "Zionists leave," "Our land is Arab and free," and "Palestine is Arab from the river to the sea." The protest was joined by Joint List MK Yousef Jabareen who told the protesters to be "proud of our struggle." "What we have seen take place on Israeli campuses over the past week is disgraceful," Im Tirtzu Chairman Matan Peleg said. "On campus grounds, students are openly inciting violence and are calling for the destruction of the State of Israel with impunity. This is a dangerous precedent that will result in violence if not stopped immediately by the heads of the universities." "The writing is on the wall and we cannot ignore it," Peleg added.